It’s pretty obvious that wrestling and comics have a lot in common. A few years ago, Chaos! Comics even went so far as to publish a few titles based around personalities in the-then WWF. Since that time, we’ve seen Raven write an issue of Spider-Man, The Hurricane play out a Green Lantern fixation on WWE, and, of course, wrestlers keep lurking on the fringes of ComicCon. Well, lurking on the fringes doesn’t cover it anymore. Though last year he wandered the halls in a floppy hat and sunglasses (some secret identity), this year Rob Van Dam hit the Con with two big projects. 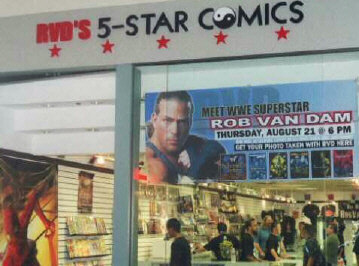 First, he brought a “preview” booth for his own comic book store, RVD’s 5-Star Comics, which officially opened in Long Beach the week after the Con. At any rate, though Rob was almost always occupied by fans, he did find a little time to stand and talk with me. I took a few breaks so that Rob could sign autographs and pose for pictures, which gave me the great opportunity to just watch the guy interact with his fans. Will it come as a surprise to you when I say that he was incredibly gracious to everyone who spoke to him, and especially enthusiastic to the kids that came up shyly? Would that be completely ruining his reputation? Whichever the case, he sure showed a lot of patience towards me, because even though the wrestling fans here have given me the official wrestling name of “The Patriarch,” I still don’t really know squat about what’s going on with the WWE. Derek McCaw: Let’s talk about your new project. Rob Van Dam: It’s a comic book. To me, it’s really a story; there’s a lot that I’d like to do with it. I’m going to release it in a comic book because I’m a huge comic book fan. It’s an ongoing story. I have over a year’s worth written out; I have a spin-off scripted and everything. I like to write. DM: You’re writing it yourself? RVD: Yes. That’s all I can do. I can’t draw; I wish I could. I’m jealous of artists, but I’ve never been one. And so Noodlesoup (Productions) is drawing it, coloring it. They’ve actually inked the first book and are coloring it now. I’m going to start the story with a four book set, to kick it all off. From there, hopefully we’ll get some demand and continue, instead of committing myself to a monthly schedule right off the bat. They’ve got number one almost wrapped up, and I’m pretty excited about it. DM: The name of the character is…? RVD: The character is Yan Goodman, that’s the guy’s name, but the story is called Twisted Perception. I haven’t given a whole lot out about the subject matter to the public yet, just because I’m waiting to have a date, a time frame, some sort of opening to materialize. Two years ago at the Con I was handing out samples of it, thinking it was going to be out soon. And here it is two years later and I already had the story for two years before that, four years now. So I’ve been a little protective of talking too much about it. DM: That’s understandable. But what would you say to someone about why they should pick it up? RVD: Obviously I’m going to get a lot of people to check it out because of my name. But besides that, the artwork is outstanding. They’ve done a great job bringing all the characters to life. I really feel passionate about the story. Really really passionate about it. I think that this comic book is going to kick other comic book’s asses. I’ve been a comic book fan since I was like seven years old, so I’m very opinionated when I read comic books. For instance, I hate it when I open up a comic book and it just starts to introduce some of the characters. Then all of a sudden the comic ends when the guy finds out that his girlfriend left him. And I’m supposed to care enough to buy the next issue or something. I hate those. I have in these four comics, each one is an individual story that opens up and has closure. The background story is like the spine of the thing, that runs all the way through it. That’s very important to me. DM: What is it about comics that you love? RVD: It’s the action. I’m an action junkie. I always have been, from martial arts movies to, obviously, pro wrestling. Comic books, in the same way, opened up my mind, opened up my imagination to the possibilities of action in a way that you can’t even do in real life. DM: How is Twisted Perception going to be different than other wrestling comics? RVD: For one, it has absolutely nothing to do with wrestling whatsoever. It’s a complete fictional story, which means it doesn’t have Rob Van Dam in it. It doesn’t even take place in a particular city, because that wasn’t what was important to me. When I read a lot of comics, it’s cool how they can capture the real feel of a New York City or New Orleans when you go there. But that’s not what this is about for me. It’s about the story. People that read it, I want them to be able to relate to it, to the extent where it could be in their town. It could be them. I swear to you, he’s holding my business card. DM: What inspired you to open a comics shop? RVD: One of my favorite things to do when I travel, which is 220 days a year, is to stop into comic book shops. I do it in all the different cities when I’m wrestling. Even in other countries, I always try to go to comic stores. And it makes me happy. I like being surrounded by comics. I’m like a little kid in a candy store when it comes to it. So it was just a natural progression to try and open up one of my own. DM: You’ve obviously been here before. What is the geekiest moment you have had personally at a convention? RVD: I don’t know. I guess maybe getting Lou Ferrigno’s autograph. That was pretty geeky, and I’m still pretty excited about that from last year.